This adventurous trip around Burma (Myanmar) takes us to fascinating sights beyond the classic highlights. We travel deep into the Mon State to Ogre Island and join local pilgrims as they admire the sunset from the sacred Golden Rock at Mount Kyaikhtiyo. We marvel at the grandeur of Bagan, discover colonial Pyin Oo Lwin and witness the fascinating world of Inle Lake. Arrive in Rangoon and check-in at the hotel. The rest of the day is free. You may wish to venture out and take in your first impressions of the city. Today we take a walking tour of Rangoon. Starting with a stroll along the banks of Kandawgyi Lake in the centre of the city we continue on to Botataung Pagoda. This pagoda is unique in that it is hollow - as we walk through we can see many ancient relics and artefacts displayed in glass cases. Later on we walk along Pansodan Street though downtown Rangoon, taking in the rich colonial architecture and bustling street markets. In the afternoon we make our way to the Chaukhtatgyi Paya, home to a giant 70 metre long reclining Buddha. The highlight of the day, though, is a visit to the magnificent Shwedagon Pagoda, the most revered Buddhist temple in Burma, whose golden stupa dominates the city skyline making it the ideal spot from which to watch the sunset. Leaving Rangoon behind we drive to the town of Bago. Founded in 573AD, it is home to a number of sacred shrines and pagodas, including the Shwemawdaw Paya (the Golden God Temple) the tallest pagoda in the country. We visit the pagoda, as well as the Shwethalyaung Reclining Buddha (the second largest in the world) and the Kyaik Pun Pagoda. In the afternoon we continue our drive to the foot of Mount Kyaikhtiyo, or Kin Pun 'base camp'. Upon arrival we continue in an open truck up a steep 11 kilometre track to the top. From here we walk for approximately 20 minutes to the mystical and highly revered Mount Kyaikhtiyo Pagoda in time for sunset. Also known as Golden Rock, this pagoda is a large boulder precariously balanced on the edge of a cliff near the top of the mountain, supposedly held in place by a hair of the Buddha. If our hotel is at the top of mountain we have a chance to view the sunrise before continuing on our way to Mawlamyine via the town of Tathon, where we will stop for lunch. If road conditions allow, we travel by way of Kawtgoon Cave, which has many intricate Buddha images carved into the walls, before proceeding on to Mawlamyine. The former capital of British Burma, Mawlamyine today is the capital of Mon State and the gateway to Burma's little visited south-eastern region. In the early evening we make visit to the 9th century Kyaikthanlan Phayar (Pagoda), the highest structure in the city, to enjoy the sunset. After breakfast we take a ferry across to Bilu Gyun (Ogre Island) to visit some of the local communities that lie along the Thanlwin River. After a chance to explore some of the villages and watch traditional craftsmen at work, we head back to Mawlamyine for an afternoon tour of the city. The afternoon is left free perhaps to visit the 100-year old monastery of Seindon Minbaya Kyaung or a walk along the Strand Road to take in every day scenes. Today we spend the day returning to Rangoon by road stopping off along the way for photo opportunities, including a visit to the Allied War Memorial Cemetery in Taukkyan which commemorates over 30,000 British Commonwealth soldiers who died in Burma during World War II. There are over 6000 beautifully well-kept graves in all (along with 52 graves of WWI soldiers). Furthermore 27,000 names of fallen soldiers with no known graves are engraved on the Rangoon Memorial, an imposing and sombre memorial pillar. We take an early morning flight to Bagan. Without doubt one of the most impressive religious sites anywhere in Asia, Bagan is an ancient city dating from the 9th to the 13th centuries with thousands of temples, stupas and monasteries covering an area of 140 square kilometres. A half-day tour of some of its most distinctive pagodas include visits to the Shwezigon Pagoda, the 13th century frescoes and cave temple of Wetkyi-in-Gubyaukgyi and the Ananda Pagoda, one of the best preserved monuments in the entire city. Late in the day we watch the sunset from a panoramic viewpoint on one of the upper terraces overlooking the temple site. After breakfast we continue our exploration of Bagan with visits to the Sulamani Temple of King Narapatisithu and the finely crafted brickwork of the Dhammayangyi Temple, the largest shrine on the site. This afternoon has then been left free to enjoy as you wish. There is a chance to take an optional trip out to Mount Popa, Burma's sacred abode of the Nats (spirit gods). A volcanic plug that rises some 1,500 metres above the surrounding landscape, the summit provides some fine panoramic views of the surrounding hills. The journey also travels via a local farm producing traditional 'toddy\ palm juice. This morning we enjoy a two to three hour boat ride along the Irrawaddy River to Pakkou, a bustling tobacco trading centre. From here we continue by road for about 3 hours to Monywa in the Chindwin Valley. This afternoon offers us the chance to visit the colourful Thanbuddhay Pagoda (home to more than 500,000 images of Buddha) and the Hiaungdawmu Buddha, the second largest reclining Buddha in Burma. Crossing the Chindwin River this morning we visit the cave chambers of Po Win Daung and Shwe Ba Daung. A system of nearly 500 sandstone caves that honeycomb the Po Win Hills, these extraordinary caverns contain around 450,000 paintings, statues and carvings, representing what many experts believe to be the most comprehensive collection of Buddhist art anywhere in South East Asia. After our visit we continue by road to Mandalay, Burma's last royal capital and, for many, the centre of its most historic and culturally rich region. En route we plan to stop in Monywee Kayemon village to visit a blacksmith and a local cottage industry where they make slippers. A short distance to the south of Mandalay lies Inwa (Ava). Here we take a horse cart ride around the old city (which can be a little bumpy), visiting the monasteries of Manu Ok Kaung and Bagaya Kyaung and the \ Leaning Tower of Inwa\ . In the afternoon we head on to the former royal capital of Amarapura, perhaps best known for the 19th century, 1.2 kilometre giant teak footbridge of U Bein that spans Lake Taungthaman. We also visit some local cotton and silk weavers, before driving back to Mandalay. This morning we take a short cruise to Mingun village and the ruins of the unfinished Mingun Pahtodawgyi (pagoda) which, had it been completed, would have been the world's largest pagoda. Begun by King Bodawpaya in 1790, the pagoda work on the monument ceased with the king's death in 1890. Nearby we also visit the giant 90 tonnes bronze Mingun Bell - considered to be the largest uncracked bell on the planet. Returning to Mandalay we then spend this afternoon exploring some of the city's major highlights, including the world's largest book at the Kuthodaw Pagoda and the intricate wooden majesty of the Shwenanda (Golden Palace) Monastery. We also plan to include visits to craft shops where you can observe traditional and skilled gold-leaf making, tapestry making and wood carving as well as the fascinating jade market. If time allows we then head up Mandalay Hill for sunset and views across the river and over the city. After breakfast we take a short walk from our hotel to Tey Yar Zay market. This is a local market selling fresh produce and street food and we will have time to explore the stalls and perhaps sample a few treats before driving to Kyaukse. In Kyaukse we visit the Tamote Shwegugyi Temple, estimated to have been built in the 11th century the one-storey temple was well hidden until fairly recently. The masonary work and carvings depicting mythical creatures are similar to those found in Bagan. We continue driving north to the former British Hillstation of Pyin Oo Lwin in the Shan Hills. Formerly known as Maymyo, after Colonel May of the 5th Bengal Infantry, it was the perfect retreat to escape the heat of Mandalay. We explore this Colonial town to see the Purcell Tower, a clock tower that was a gift from Queen Victoria; the morning vegetable market; the 100 year old Church of the Immaculate Conception and the National Kandawgyi Botanical Gardens, built by Turkish prisoners of war during WWI. We also stop at Naung Kan Gyi Paya, a hilltop pagoda, from where we can enjoy panoramic views of town. Today is a free day with the option for a day walk amongst the surrounding countryside. The walk takes us through the patchwork of rolling hills found in this area, and past rural villages inhabited by the Danu and Shan ethnic groups. The highlight of this walk is enjoying a hearty and home-cooked lunch in the house of one of the villages, offering an insight into the daily lives of these remote communities. The walk will take approximately 4-5 hours in duration and is graded moderate, with no steep ascents or descents but rolling terrain. As an alternative to the walk it is possible to hire bicycles to further explore the town and its immediate surroundings, or you could simply choose to relax and soak up this town's sleepy atmosphere. Later in the afternoon we will leave Pyin Oo Lwin and make the short drive of around 2 hours back to Mandalay. This morning we fly to Heho. From here we drive through villages and endless fields of dry cultivated mountain rice and potato. We make a stop at Pindaya noted for its extensive limestone caves filled with nearly 8,000 Buddha images of different sizes and made of various materials. Nearby we have the opportunity to visit a local family to see how they make paper umbrellas from the bark of a mulberry tree. In the afternoon we continue on to Kalaw. Set in the edge of the Shan Plateau this charming Colonial town was popular with the British during their time in Burma. The remainder of the day is free for you to Explore Kalaw. This morning sees an opportunity to explore this engaging hill town, whose attractions include the gold lacquered bamboo Buddha of Nee Paya and the Catholic church of Christ the King. We then continue on by road for two hours to the beautiful setting of Lake Inle, high up on the Shan Plateau. Surrounded by hills and populated predominantly by the Intha people, Lake Inle is one of the highest lakes in the country. Devout Buddhists, the local population of self-sufficient farmers and fishermen live in simple stilted houses of wood and bamboo, growing their food on floating gardens of grass and seaweed. We plan to make a tour of some of the local villages by boat and pay a visit to the famous monastery of Nga Phae. Time permitting we will make a short visit to Leshae Village where you can see the making of Buddha images from dried flower powder. Our boat takes us to the western part of the lake this morning, to a local Indein village, where we visit a hilltop complex of 1,000 stupas (places of worship). From up here we can enjoy some great views across the lake and on to the valley beyond. Continuing by boat on to the villages of Nanpan and Innpawkhone, we also get a chance later in the day to see some traditional boat making and silk weaving, and hopefully some local fishermen practicing their uniquely distinctive rowing technique. We pay a visit to the city's fish market this morning, before you take a flight on to Thandwe. Please be aware that the beach extension is unescorted. At the airport in Thandwe you will be met and driven to the hotel where you spend the next three nights. The rest of the day is then free. Today is left free to relax on Ngapali beach. There are various optional excursions, such as boat trips or snorkelling, which can be arranged and paid for locally. The nearby fishing village also offers an interesting insight into local life. There is more free time today to try oprional excursions, explore the local area or simply relax on the beach. You leave the beach behind and make your way back to Rangoon by plane. The rest of the day is left free for further sightseeing in the sprawling city. You may like to visit the immense Bogyoke Market, formerly known as Scott's Market, for souvenir or gift hunting (closed on Mondays, full moons and public holidays). You will need loose fitting, comfortable clothes for hot, humid conditions. Sunhat, sunglasses, long trousers and long sleeved shirt essential for protection from the sun. Warm weather clothing is suitable for Rangoon, Mandalay and Bagan. The Shan highlands, Inle Lake and Kalaw are cooler and in the winter season and temperatures may reach near zero at night, with the mornings often remaining cold. Please dress respectfully when visiting temples and religious sites, covering your torso, shoulders and legs to below the knee and easily removable footwear for convenience as you can only enter sacred sites barefoot. In general, as Burma is a traditional, conservative and largely Buddhist culture we recommend you do not wear revealing clothing. One main piece of baggage, a daypack and an overnight bag for your visit to Golden Rock. Remember you are expected to carry your own luggage so don't overload yourself. Mobile phones: Your mobile will not work in Burma. It is possible to buy a local SIM card for US$ 20 in order to make/receive international calls, as long as your phone is un-locked. SMS messaging is not possible. WiFi is available in most hotels. Although entirely voluntary, tipping is a recognised part of life in this region of the world. Some local staff will look to members of the group for personal recognition of particular services provided. Accordingly please allow US$ 60 for tipping. In order to make things easier for you, the Tour Leaders may organise a group's tips kitty and if this is the case, they will account for it throughout the tour. This three week adventure is perfect for travellers with more time to spare and who want to really get under the skin of the destination. The tour features all the main sights of our Burma Highlights (BUH) holiday, but also takes you deeper into less visited areas such as Mawlamyine in the south east and Pyin Oo Lwin in the north. 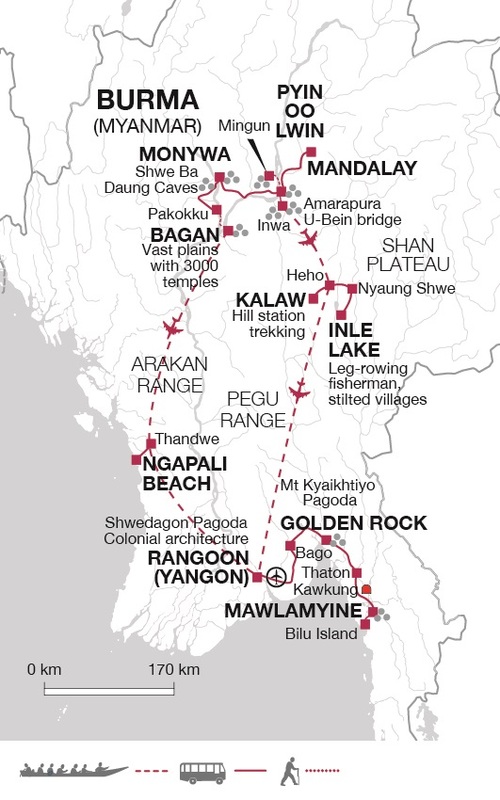 You will have the chance to discover caves in Monywa and to walk up to the iconic Golden Rock as well as discover Burma's classic sights.